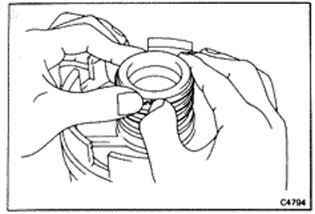 Place SST on spring retainer and compress the springs with a shop press. 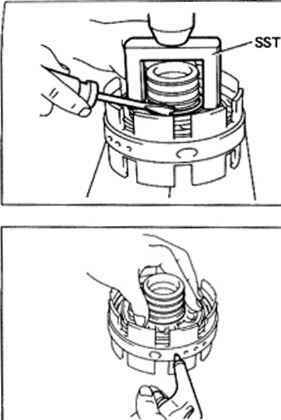 Blow compressed air through the center support oil hole to remove the No. 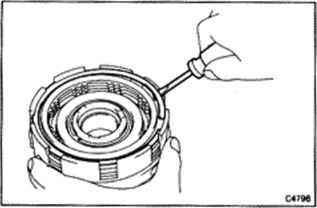 1 brake piston. 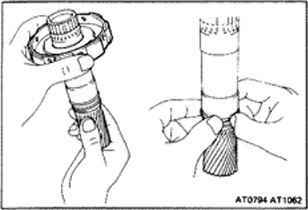 If the piston does not pop out. lift it out with needle-nose pliers. Blow compressed air through the center support oil hole to remove the No. 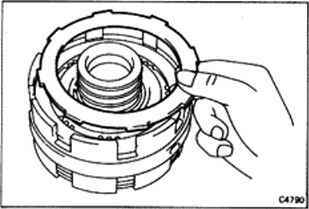 2 brake piston. 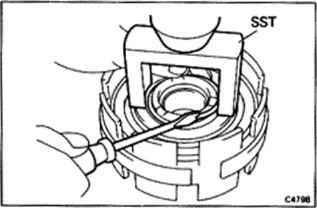 If the piston does not pop out, lift it out with needle-nose pliers. CAUTION: Do not spread the ring ends too much. Hold the No. 2 brake hub and turn the sun gear. 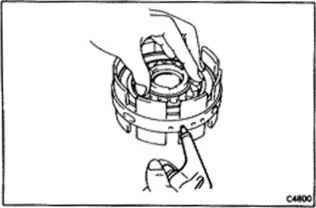 The sun gear should turn freely counterclockwise and should lock clockwise. 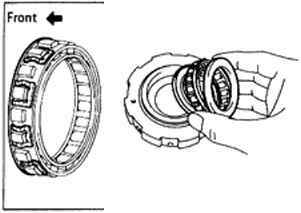 If the one-way clutch does not work properly, replace it. (a) Bend several tabs back with a tapered punch. (b) Pry off the retainer with a screwdriver. 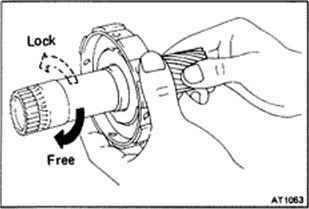 Leave the other retainer on the hub. 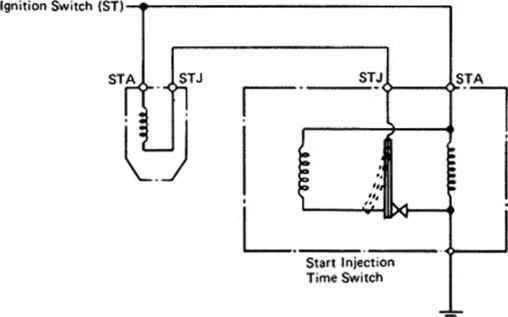 (c) Remove the one-way clutch. 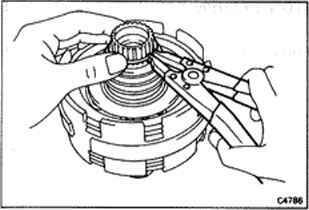 (d) Install the one-way clutch into the brake hub, facing the spring cage toward the front. (e) Hold the brake hub in a vise with soft jaws, and fl ten the ears with a chisel. (f) Check to make sure that the retainer is centered. 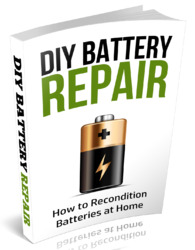 If the disc is worn or burnt, replace all discs. 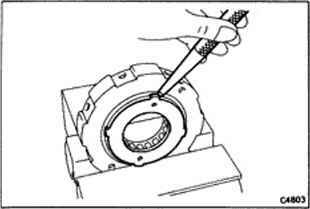 Then check that the sliding surfaces of plate and flange are not worn or burnt. NOTE: Do not allow the discs to dry out. Prepare new discs by soaking them at least two hours in ATF.